Last week, we made a short trip Pennsylvania. My wife has family in Huntingdon, a small town in the central part of the state, and they invited us to stay at their home for a few days. We used that time to explore and a great tour of a small college. Here are the highlights. On the first day, we drove through five states – Tennessee, Kentucky, West Virginia, Maryland and Pennsylvania. It was a long drive through Appalachia, but we saw some beautiful landscapes. When we left the interstate around Altoona, we did not realize that we would not be on the interstate for a few more days. Instead, we would be taking back roads through farmland. On the second day, we passed through some of that farmland on the way to Hershey, Pennsylvania. Hersheypark was our destination. The girls rode a ton of rides while my wife and I rode a few. 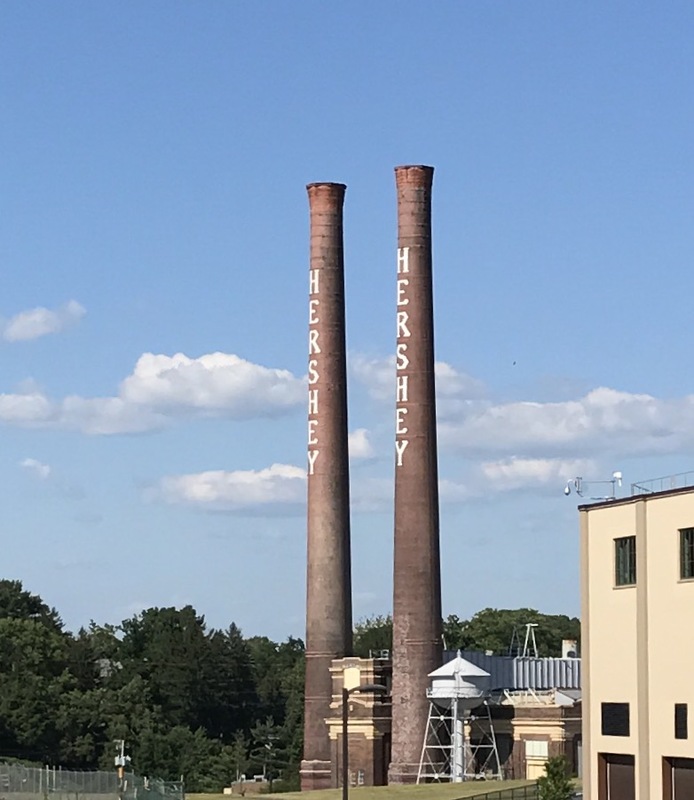 I must be getting old because the monorail was my favorite because it took us by part of the old Hershey factory. One of these days, I am going to get back there and check out the history of chocolate. Oh yeah, we had a slight surprise when we got back to Huntingdon. We went to a local restaurant for dinner, and my wife order a salad with grilled chicken. She received a salad topped with grilled chicken and french fries. She was, in a word, appalled. We later learned that french fries on salad is a central Pennsylvania thing. I guess it is like grits is a southern thing. Although, I can handle french fries on a salad better than I can handle grits. On the third day, we got educational. 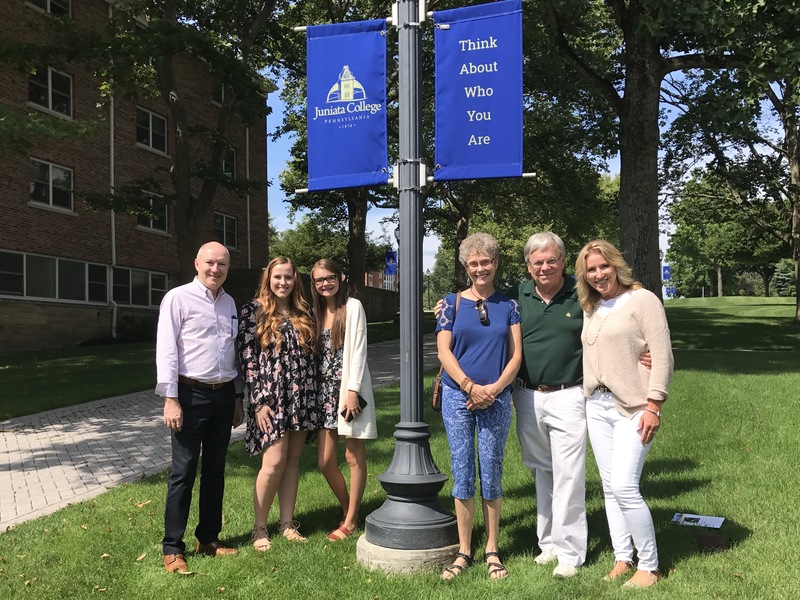 Huntingdon is home to Juniata College, and the family we were visiting used to be the president and first lady of the liberal arts institution. It is a beautiful campus with a great quad for student to gather. I think my stepdaughter liked it until she saw the dorm room. We had to explain that what she saw is pretty typical for dorm rooms. 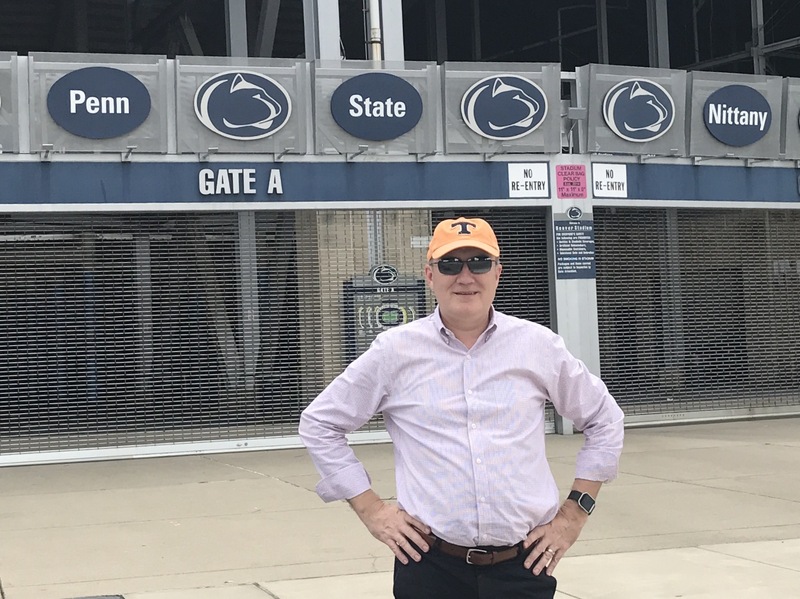 After that, we drove a short distance to State College to the campus of Penn State. This was not an official visit. I simply wanted to see the football stadium. Of course, I had to wear the colors of my team behind enemy lines. I was also told to go to the Creamery. It was a great suggestion. The ice cream was awesome. On the fourth day, we headed west to two sites that my wife and I really wanted to visit. This was a day to show my stepdaughter and her friend something about our past. 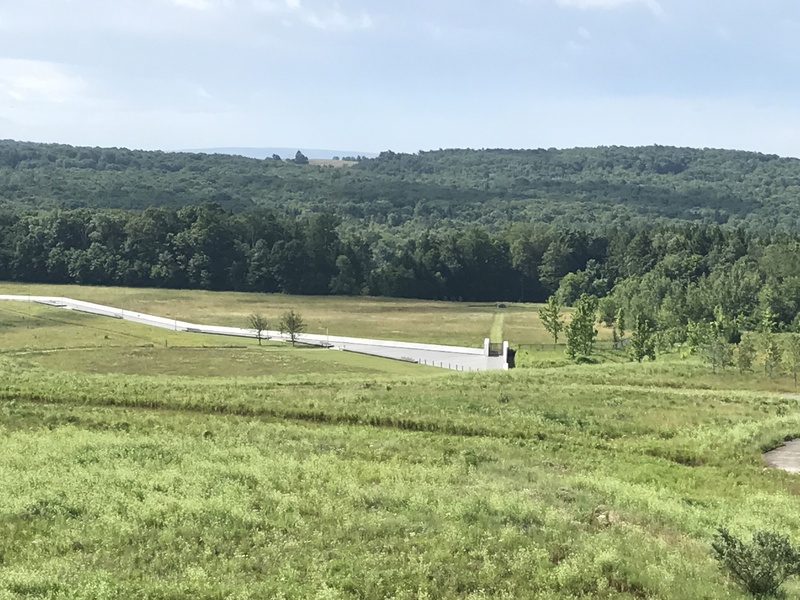 After a bit of a drive through the countryside, we arrived at the Flight 93 National Memorial. On September 11, 2001, the flight was hijacked, and the passengers learned of the other hijackings through calls to their loved ones. At some point, the passengers decided to attack the terrorists. As they struggled, the plane crashed into a field. It is a sobering place to visit. For those of us who remember, it brings back memories of that terrible day. For those of us who do not remember, it brings questions of what happened. For all of us, it provides a true example of heroism. As I walked through the museum and over the grounds, I kept wondering what the passengers were thinking. Did they know they were going to crash somewhere and wanted to make sure it was not another building? Did they think they could take over and have a chance at landing the plane? All we know is that they prevented the plane from hitting something in Washington, D.C., which was only 20 minutes away. Investigators think the plane was heading for Capitol Hill. After visiting the memorial, we drove through more countryside. This time we really hit some back roads and passed farm after farm. Finally, we made it to Fallingwater, the home famously designed by Frank Lloyd Wright. My wife and I visited another of his designs earlier in the year, but this is the iconic one that I have always wanted to see. He designed the home for the Kaufmann family, who wanted a view of the waterfall on their land. Instead, Wright built it on the waterfall. Amazingly, the house was built during the midst of the Great Depression. 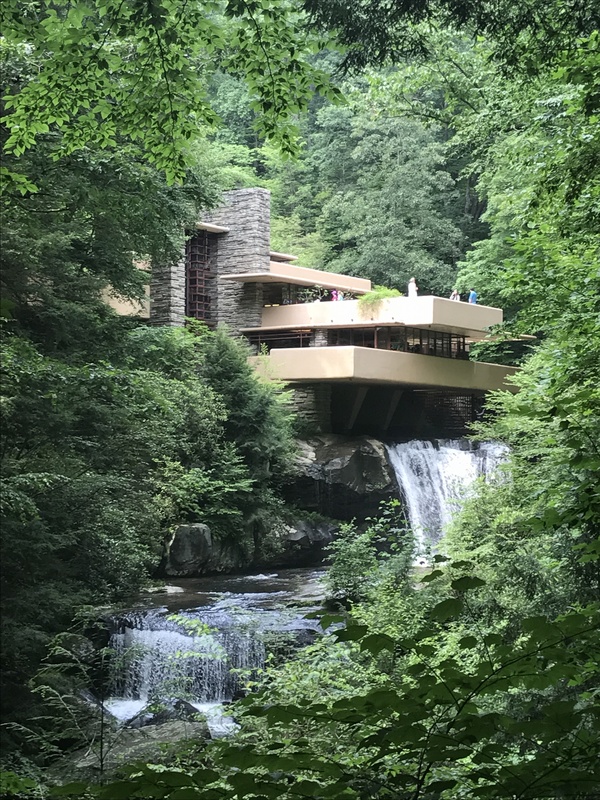 When we left Fallingwater, we headed toward home but could not make it all the way. We stopped in Huntington, West Virginia for the night. The girls stayed at the hotel and watched Netflix while we went to dinner. We found a great place near downtown called Savannah’s and took a table on their patio. Our waitress was a local student who was majoring in History and Anthropology. Now, she has the right idea.